Crudo is a technique for serving raw fish and shellfish. 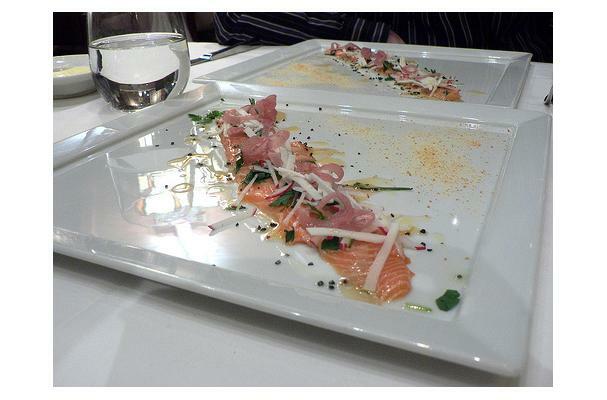 It is similar to Japanese sashimi, but derives from Italian preparations. Crudo was popularized in the United States by Chef David Pasternack and owners Mario Batali and Joseph Bastianich at their restaurant Esca in New York. The technique continues to evolve, but commonly involves thinly slicing fresh fish and serving it with a drizzle of high quality olive oil, lemon or other citrus juice, and/or herbs or microgreens. Notable West Coast examples of Crudo are served at Bar Crudo in San Francisco and Union Restaurant in Seattle.